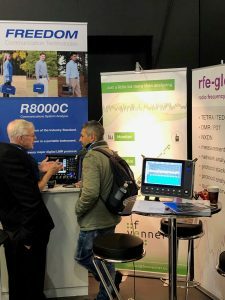 FREEDOM products were displayed prominently at this week’s PMR Expo in Cologne, Germany. FREEDOM is the only PMR test solutions provider to offer a comprehensive suite of TETRA test offerings – DMO, TMO, Base Station Monitoring and T1 testing – in a fully portable package. In addition to its TETRA products, FREEDOM was showing its revolutionary R9000, the industry’s first instrument to include the full range of PMR protocols along with a Vector Network Analyzer and LTE test capability. 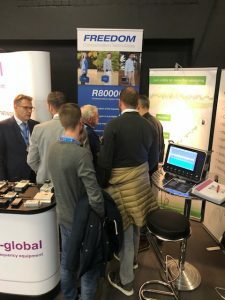 FREEDOM products were displayed in the booth of its German based distributor rfe-Global.